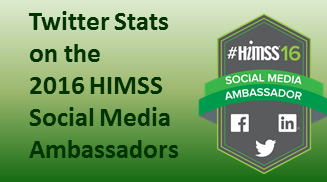 Here are some interesting (at least to me) statistics regarding the Twitter accounts of the 2016 HIMSS Social Media Ambassadors. Whether attending the 2016 HIMSS Conference in person or not, you may want to follow some or all of these SMA's. You can follow these SMA's individually or all at once using this Twitter List of 2016 HIMSS Social Media Ambassadors. @Colin_Hung Colin Hung True believer in #HealthIT & patient empowerment. By day, Marketing @StericycleComms @PatientPrompt. By night, #hcldr co-founder & moderator. @drstclaire Tamara StClaire Creating the future of patient-driven care @XeroxHealthcare. Passionate about #mHealth and #Telehealth possibilities. @gnayyar Geeta Nayyar, MD MBA Tweeting from a doctors' POV on #mHealth #HealthTech #DigitalHealth & More. Feminista, Mom & Indian American. @janicemccallum Janice McCallum Consultant. Specialize in sources & uses of #healthdata, #healthIT, #CDS & #EBM. Independent board member. #HIMSS16 SoMe ambassador. @Matt_R_Fisher Matt Fisher Healthcare lawyer. Focus on regulatory compliance, HIPAA, privacy/security, fraud & abuse. Chair of Mirick O’Connell Health Law Group. Views ≠ legal advice. @techguy John Lynn Blogger and Entrepreneur. See also @ehrandhit @tvblog #vegastech, ultimate frisbee, etc etc etc.